So maybe through lots of hard graft you have managed to get yourself onto the property ladder. Well done good start ! Maybe you have found your dream house or flat and are awaiting a completion date from the solicitor. So now is the time to find the final piece to puzzle, finding a man with a van removals service that you can rely on. If you are completing on the day of your move especially if you are moving a long distance it is key that you hire a man and van removals company that has the capacity to move you in one go. Often completion key exchange and transfer of fund all happen at around 1200 midday meaning that you need to be out of your property have it clean and ready for your purchasers to move in. With this in mind it is wise to consider the size and number of vans any man with a van removals company has in its fleet. You don’t want to be left having to do a second trip back to your old house when the new occupants have been waiting to move in and you don’t want to end up with additional charges for this. To avoid this man with a van removals service offers free surveys to customer who are buying and selling flat and housese. We hope that this service can help take the pressure of what can turn out to be a very stressful experience if not planned and managed by professionals. To help things run smoothly and take the pressure off we also offer a packing service which allows us to see how many boxes you have for your move and ensures we will arrive with enough van space to complete your move in a single trip. Imagine that, a man with a van removals service that does all the hard work so you have time to concentrate on all the little things often forgotten about when moving house. Such as changing over all your utility bills, cleaning the house for the arrival of the new occupants. Imagine getting to your new property with everything packed by a professional man with a van removals service. And when you unpack you can be sure nothing will be broken and all the boxes are accurately labelled and in the correct rooms for unpacking. Well look no further because at On The Dot we offer all these services and to cap things off all our packing materials have minimal environmental impact and are either recycled, re used or biodegradable. For piece of mind choose our man with a van removals service today and get everything looked after. 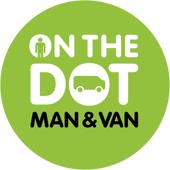 Why choose On The Dot Man & Van?